"Hey, Laurelpaw, are you awake?" he meowed from outside the apprentice´s den. 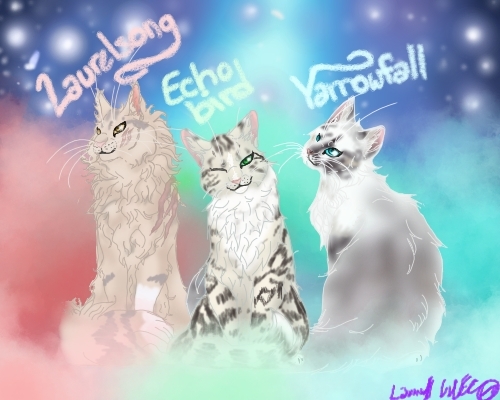 Laurelpaw formerly known as Lengxue woke to hear her mentor's voice with a small stretch she smiled somewhat eagerly"yes I'm up Liontail sir"She mewed pushing her way out of the apprentices den. Liontail smiled when he saw his apprentice, purring in greeting. "Good morning Laurelpaw, i hope you´re ready, we have a hunting patrol today, i´m gonna teach you as much as i can, think you can take it~?" "Yes I'm ready" She mewed her curly furred tail stood straight up. "Let's go " She mewed heading for the entrance. "Alright Laurelpaw" -he said as he stopped walking and sat in from of his apprentice- "One question... have anyone taught you the basics of hunting? like the hunter´s crouch and stalking the prey?" "Well... A little I know enough but maybe it's best I see for myself how it's suppose to go here" Laurel paw mewed. Liontail noded "Alright then, just to be sure i´ll start with the basics"
The older tom padded a few steps away and lowered himself into a crouch. "I'll show you the hunter's crouch first, you have to distribute weight between all four paws, and when you step forward you must step slowly and carefully, keep your tail straight and still, and don't let your belly fur brush against the ground." as he talked, he began stalking forward very softly, the ground underpaw didn't even crunch as he carefully placed each paw down. Then he sits, looking at the young she-cat "Your turn Laurel, let´s see how you do it, and don´t worry if you don´t do it well at first" he assured her. She watched intently as he mentor shows her how to do the hunters crouch. Which from what she had tried when she had stayed at River clan she knew she had messed up. Crouching as her mentor showed her she kept her tail straight and still as she moved forward slowly as Liontail showed her."like... This? "she asked quietly. Liontail purred "You´re doing purr-fect" he praised. "You just need a bit practice before you can perfect the hunter's crouch and stalk, though. Keep practicing a little more, and then I'll teach you how to pounce." Laurelpaw blinked before she gave a small nod figuring it wouldn't hurt. Quietlt she kept practicing crouching and moving forward quietly until Liontail told her she was good. Liontail watched her performing the hunter´s crouch for a minute, she was doing quite alright. 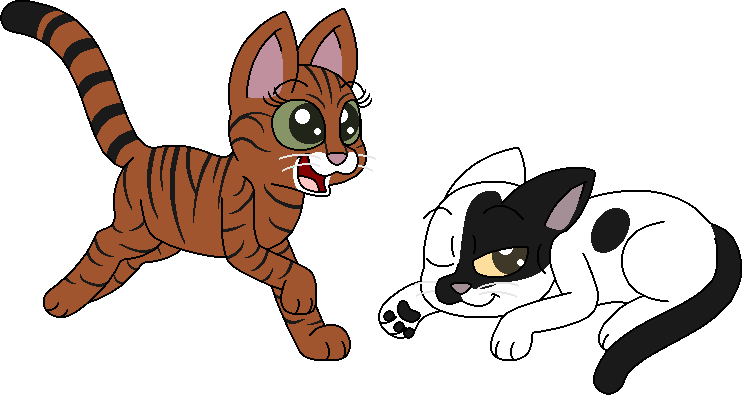 "Okay, Laurelpaw, you´re doing awesome" he praised "Now, let me show you how to pounce." He looked around and went to pick up a large leaf, came back and placed the leaf a few tail-lengths away. "Here's what you'll do now, you'll stalk up on the leaf, imagine it's a mouse, then once you're close enough you'll pounce on it, you have to bundle up your haunches to gather up power in your legs for the pounce, and you must keep your back straight while you're in the air and your claws unsheathed when you land on it" demonstrating again, he slowly and silently crept up to the leaf, then wiggled his haunches a little before pouncing, keeping his back straight, he landed on the leaf with his forepaws first. "Let me see how you do that"